Does your four-legged friend deserve a cuddly companion during Christmas? 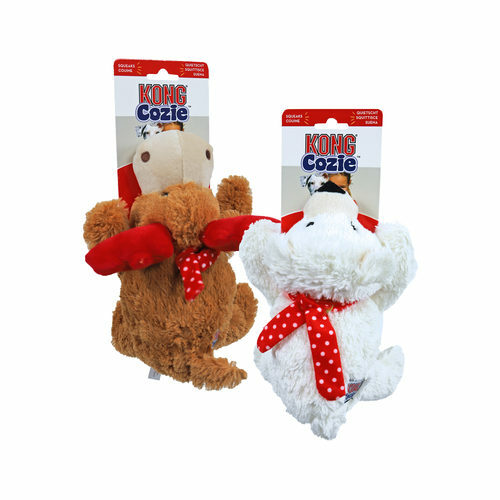 The KONG Cozie X-Mas is a soft cuddly toy with a squeaker for extra fun. The Cozie X-Mas is available in the shape of a reindeer or a polar bear. Pamper your four-legged friend with the fun KONG Cozie X-Mas. This soft cuddly toy from KONG contains a squeaker for extra fun! The cute stuffed animal is available in the shape of a reindeer or polar bear. The Cozie X-Mas is not only soft, but also very sturdy; as it is made out of a two-layer material. Contains a squeaker for extra fun! Have you used KONG Cozie X-Mas before? Let us know what you think about this product.